LG has announced today the launch of its W2363V gaming monitor in the UK. With an ultra-sharp response time of just 2ms, the monitor is perfect for videogames as it matches the time it takes your brain to respond to images, resulting in a complete lack of lag when playing. TechRadar managed to get up close and personal with the monitor today, and was impressed with the design of LG's latest Flatron. Its size is decent enough for the bedroom or study – at 23-inches – and contrast ratio is at 70,000:1. 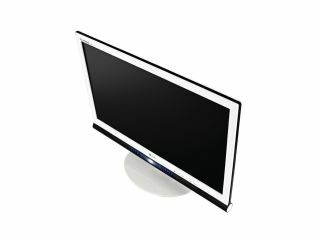 Connectivity on the monitor comes in the form of 2 x HDMI ports, D-sub, DVI, and component, and the monitor also features similar technology as seen in LG's TV range – in that the monitor features auto brightness technology. Speaking at the LG event today was Futurologist Ian Pearson, who explained that he used to work in the missile industry and that a 2ms response time on monitors was vital in his job. "We used to design head-up displays for fighter pilots to try and kill things on the battlefield. One of the really key bits of information I remember back then is 'two milliseconds'," explained Pearson. "This is the response time you need for a display to keep up with the brain of a fighter pilot." He continued: "When it comes to gaming 30ms is alright, 10ms will cut it if you don't really care about the result. But if you really care about the result of that game and you are playing at the top level, then 2ms is when your brain can't tell the difference." While LG certainly isn't the first company to offer monitors with a 2ms response time, it is interesting to hear quite why this stat is an important one in the gaming sector. The LG W2363V Flatron monitor has a release date of later in the year, and will cost you £210. Go to www.lg.com/uk for more details.